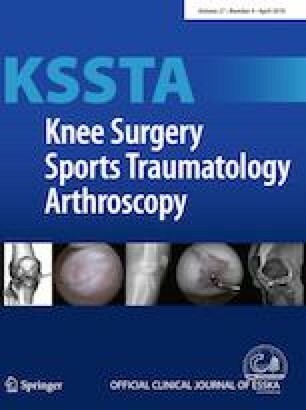 Develop a framework to quantify the size, location and severity of femoral and acetabular-sided cartilage and labral damage observed in patients undergoing hip arthroscopy, and generate a database of individual defect parameters to facilitate future research and treatment efforts. The size, location, and severity of cartilage and labral damage were prospectively collected using a custom, standardized post-operative template for 100 consecutive patients with femoroacetabular impingement syndrome. Chondrolabral junction damage, isolated intrasubstance labral damage, isolated acetabular cartilage damage and femoral cartilage damage were quantified and recorded using a combination of Beck and ICRS criteria. Radiographic measurements including alpha angle, head–neck offset, lateral centre edge angle and acetabular index were calculated and compared to the aforementioned chondral data using a multivariable logistic regression model and adjusted odd’s ratio. Reliability among measurements were assessed using the kappa statistic and intraclass coefficients were used to evaluate continuous variables. Damage to the acetabular cartilage originating at the chondrolabral junction was the most common finding in 97 hips (97%) and was usually accompanied by labral damage in 65 hips (65%). The width (p = 0.003) and clock-face length (p = 0.016) of the damaged region both increased alpha angle on anteroposterior films. 10% of hips had femoral cartilage damage while only 2 (2%) of hips had isolated defects to either the acetabular cartilage or labrum. The adjusted odds of severe cartilage (p = 0.022) and labral damage (p = 0.046) increased with radiographic cam deformity but was not related to radiographic measures of acetabular coverage. Damage at the chondrolabral junction was very common in this hip arthroscopy cohort, while isolated defects to the acetabular cartilage or labrum were rare. These data demonstrate that the severity of cam morphology, quantified through radiographic measurements, is a primary predictor of location and severity of chondral and labral damage and focal chondral defects may represent a unique subset of patients that deserve further study. The online version of this article ( https://doi.org/10.1007/s00167-018-4861-2) contains supplementary material, which is available to authorized users. This research was supported by a grant from the LS Peery Foundation, Discovery Program in Musculoskeletal Restoration and a Seed Grant from the University of Utah Research Foundation. All designated authors have made substantial contributions to the (1) conception and design of the study, (2) drafting and/or revising the article, and (3) have provided final approval of the submitted version. Dr. TM (travis.maak@hsc.utah.edu) acting as Principal Investigator and Corresponding Author takes responsibility for the integrity of the work as whole from inception to finished article. The study sponsor played no role in: study design, collection, analysis, or interpretation of data; writing of the manuscript; or the decision to submit the manuscript for publication. Dr. Stephen Aoki reports personal fees from Stryker Medical outside of the submitted work. Dr. Aaron Krych reports personal fees from Arthrex Inc. outside the submitted work. Dr. Travis Maak reports personal fees from Arthrex Inc. outside the submitted work. All procedures performed in this study were in accordance with the ethical standards of the University of Utah institutional research board and with the 1964 Helsinki declaration and its later amendments or comparable ethical standards. Informed consent was not required for this type of study.